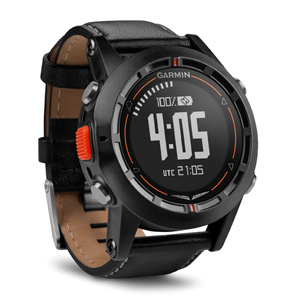 GPS Smartwatch with High‐resolution Mapping, Weather Radar Overlay and More. Garmin is pleased to announce the D2 Charlie aviator watch, an elegant and functional timepiece that boasts global navigation information, rich and colorful moving maps and a host of connectivity options. Designed with pilots, aviation enthusiasts and aspiring pilots in mind, the D2 Charlie aviator watch features high-resolution mapping, real-time worldwide weather radar as well as airport information that includes frequencies, runway information, METAR data and more. Garmin ElevateTM wrist heart rate technology also allows customers to measure heart rate 24/7 alongside daily activity tracking. Available with leather and silicone bands or in a titanium edition featuring titanium and silicone bands, D2 Charlie can easily adapt in seconds using these new QuickFitTM bands for use in the cockpit, on the golf course or in the boardroom. For more information on this product, see the Product Page.